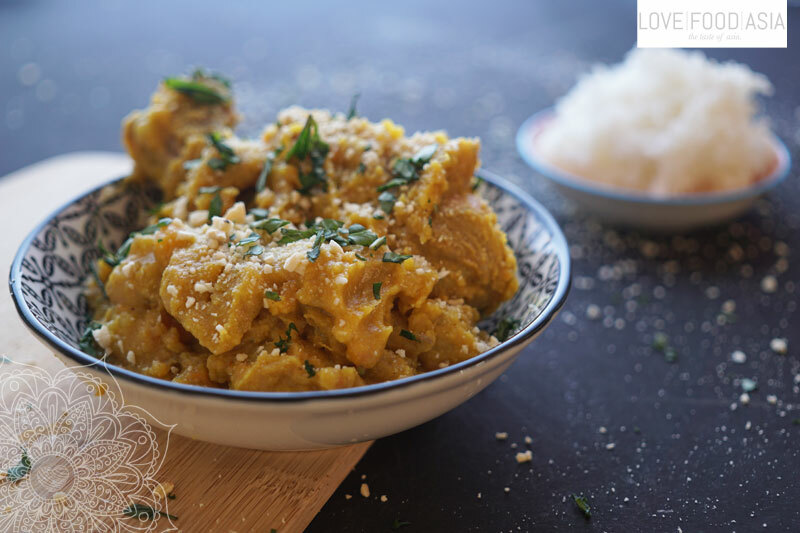 Indonesian Chicken Curry (Gulai Ayam) | Love.Food.Asia. Gulai Ayam is a traditional Indonesian dish of chicken cooked in curry-like spicy, rich and succulent yellowish sauce called gulai. It is originally from West Sumatra (Padang). It can be classified as an Indonesian curry. Together with gulai kambing, (goat or mutton gulai), it was the most common and popular variant of gulai. Remove skin of the chicken drumsticks. Heat oil in a saucepan. Add curry paste, kaffir lime leaves, lemongras and cinnamon and fry for 2 minutes on medium heat. Stir in onion and chicken drumsticks and fry for 4-5 minutes from both sides. Add half of the coconut milk, sweet potato and potato and simmer for 30 minutes. Pour in the other half of the coconut milk and simmer for another 10 minutes. Now you can remove the bones of the drumsticks if you like. The meat should be very soft. Season with salt and serve with roasted macadamia nuts and fresh jasmin rice.